Today is an auspicious day for us. It is Sunday, the 20th of the month of Baishakh, in the Bengali year 1382. We are sitting in the courtyard of Anandamayi, near her feet, and with us are four disciples from America: Premananda, Yogananda, Nityananda, Gyanananda. Today I shall speak a little bit about the meaning of this word "guru," and they will translate this into English. What is the Guru? Once long ago we had a great king, Janak. Janak Maharshi. He made a vow: "He who can give me the knowledge of Brahma in the wink of an eye, he will be my guru." That knowledge of Brahma, which cannot be had even after doing penance for many lifetimes, to get that knowledge edge in the wink of an eye is impossible! Sanak and other sages and rishis, sixty thousand great rishis came and sat, motionless, and whoever would give King Janak the knowledge of Brahma in the wink of an eye would be his guru. They all sat motionless and silent. At that time there was one rishi named Ashtavakra, who was deformed. He came, stooping over, to the guru seat which King Janak had prepared. King Janak asked, "Will you be my guru?" Ashtavakra Rishi said, "Yes, I will be your guru." "You will give me the knowledge of Brahma in the wink of an eye?" "Indeed, I will give you that," said the Rishi. Then King Janak asked him, "So, you will give me initiation?" Ashtavakra Rishi answered, "Yes, I will give you initiation. But first you must give me the guru-fee. Because after I have become your guru, I cannot take any fee from you. Our Vedantic religion, our Hindu Sanatan Dharma, is very strict. There is no getting a guru before giving the teachers fee." Then Ashtavakra Rishi said, "Maharaj, there are three things you must give me for the guru-fee. The first is the body, the second is the mind, the third is your wealth. You have to give me these things first." In the presence of those sixty-thousand rishis King Janak promptly and ungrudgingly gave these gifts. First he gave his body, meaning the physical body. Secondly he gave his mind. And thirdly, he gave all his wealth. By wealth we do not mean gold, pearls, or gems. Our real wealth is our eyes, our ears, our tongue, our nose. Within this body there are great riches. These riches King Janak gave ungrudgingly. After taking the gifts, Ashtavakra Rishi, sitting on the guru seat said, "Tell me now, King Janak, just who will take this knowledge of Brahma? Who will receive this knowledge of God"? Then Janak said, "What? "I!" And again he exclaimed, "I!" Ashtavakra said, "What does I mean? All that you gave me: your body, your mind, your riches, if this is not 'I' then where else is I?" King Janak became very thoughtful. If the guru gives his grace, of course we will attain to God! Here the need arises for complete and total faith. In this way we must have faith: a faith in which there are no faults or failings what so ever. No error at all. There is a saying, Faith will get you the truth but debate takes for ever. What is the meaning of guru? He in whom there is no ignorance. Chokkumilitong Jeno, Tasmai Shri Guruve Namah. Then King Janak had the knowledge of Brahma in the wink of an eye. What was it? Guru God! Guru Bhagavan! You cannot get that knowledge of Brahma without the Gurus Blessing and the Gurus Grace. In the same way, we cannot see our own face. We need a mirror. We see our face in a mirror. We shave the beard, we can see the face, or we put on the tilak, or we can just get a very good look at the whole face. We can see it very well. This looking-glass or mirror is the gurus blessing. We cannot see our own face by ourselves. We can see the face of another, but we cannot see our own face. With the help of the mirror, we can see. This first story is from the "Guru Gita." The second story today is: you must take a guru. Why must one take a guru? When we sit for worship in our eternal Hindu religion, and in all religions, there is this obeisance to the guru, or Guruve Namah. Who? Father. Param Guruve Namah. Who is that? Mother. Parapar Guruve Namah. Who is he? He who gives the mantra in our ear. Paramesti Guruve namah. Who? That is Brahma, Atma. These are four gurus. One day Narada Rishi went to the assembly of the gods. Thirty-three crores of gods were sitting there. That Narada Rishi, what a devotee of God he was! Always drunk with Gods name, he traveled on foot, without beast or cart, throughout the three worlds. When he went to the assembly of gods, he was given a small seat below everyone else. Narada Rishi sat down before them. All of the Gods were there: Indra, Vayu, Varuna, Yama, Dijopal, the Nine Planets, thirty-three crores of them sitting in splendor offering oblations of wheat into the sacred fire. Narada Rishi, with a touch of sadness stirring in his heart, questioned the Great Father Brahma. "Oh Great Father Brahma, I am your own child! Why do I have such a low seat today?" Brahma replied, laughing, "Narada, you are Gods great devotee! You are always singing Gods name, but you have never taken a guru. For that reason your seat is so low." Then Narada thought to himself, "Its true. I have no guru-mantra. In accordance with Mothers order I practice repeating the name of God, but I have never taken a mantra from a guru." Then Narada Rishi vowed to all the gods: "He whose face I see first at dawn, him shall I graciously accept as my guru. I will take initiation from him and return to this assembly of gods." This was great faith and trust in God! This was the practice of spontaneous devotion. That night Narada slept soundly. In the early morning he opened the door and saw an old fisherman with a net on his shoulder and the pole of the net in his hand. As he was walking along on his way to catch fish, he was weaving his net. Before he had even see the face of the fisherman, Narada ran to him. Bowing at his feet he said, "Old fisherman! You must give me initiation! You are my guru! I have vowed that he whose face I see at daybreak, him shall I graciously accept as my guru." The old fisherman said, "What this? Oh Thakur! You are a rishi, the greatest of them all, Narada Rishi! The Lords great devotee! I am only a low-caste fisherman. I catch fish, I throw the net. I will be your guru? Dont make a mistake. Let go of my feet!" But Narada would not let go of his feet. He said to the fisherman, "Look, please give me initiation." The fisherman said, "But I dont know even a single mantra! I have never taken initiation myself! What mantra could I give you?" "That which is in your mind, give me that." The meaning of the word mantra is "mon-tor," "mon-tor" (Your-mind). Whatever word the guru speaks, if there is complete faith in that word, then that word is verily the best mantra. The fisherman thought to himself and then said, "But I dont know anything else. I just throw the nets at the pond, swinging them around my head, singing, Oh, Hari Bol, Oh Hari Bol! This is what we fishermen sing when we throw the nets to catch fish." Narada Rishi said calmly, "Okay, give me that very one," and he leaned forward to receive the mantra. Then the fisherman said, "Oh, Hari Bol! Oh, Hari Bol! Oh, Hari Bol!" He said it three times and then left. Narada bowed to his guru. When he went back to the assembly of the gods, the gods were able to know that Narada had received a mantra from a guru. They put his seat very high. Then the Great Father Brahma said, "Narada, sit down on this high seat!" Narada asked him, "Why is my seat so high today?" "Ah! Today you have taken a guru and received initiation, havent you? For that reason your seat is so high. And we shall all pay homage to your guru. Please request your guru to come. We should all like to see him who is the guru of Narada Rishi!" Narada then thought to himself, "This is distressing! A dreadful problem!" Narada knew that he had taken initiation from a mere fisherman. "I promised," he thought, "that he whose face I would see first this morning, him I would take for my guru." All the thirty-three crores of gods said with one voice, "Please, you must bring your guru. We all wish to see him, and together to bow at his feet." What could Narada do? A difficult situation! He went running back to the old fisherman. Bowing at his feet he said, "You must go with me to the assembly of the gods! Please, climb on my back! Without beast or cart we shall travel across the three worlds!" The guru fisherman said, "Narada! What an astonishing thing to say! Hari Baba! You are the great Rishi Narada! You are Gods devotee! You are going to carry me piggyback?" The old fisherman was somewhat lame and didnt want to go, but Narada would not release him. As Narada took him on his shoulders to the assembly of the gods, the ancient fisherman kept hold of his net. And the stick, with which he weaved his net, he held on to that as well. Taking these belongings he went with Narada to the kingdom of heaven. The gods were waiting. When they saw, they were all astounded. "What is this? Narada Rishis guru is an old fisherman?" They all rose in amazement. They asked Narada "Is this the guru you said you had accepted?" Narada then revealed the truth to them. "Yesterday I promised this assembly of gods that he whose face I would see when I rose this morning, him I would graciously accept as my guru. So when I opened the door and saw this fisherman walking along, I said, This is no fisherman, and I accepted him as my guru. So you please bow down at his feet." holding the two feet of the guru in the hands, the head goes down on top of the feet, lying completely prostrate. In this shastanga position, Narada bowed to his guru. All the thirty-three crores of gods moved to bow down to Narada Rishis guru. And when they came to pranam, what did they see? That old fisherman was no fisherman! This was all Gods test. All of a sudden instead of the form of the fisherman there appeared Shiva himself! He whom we call Shankar. Shiva! Narada Rishis guru was Shiva! That which was the form of the fisherman, that which was the net, this was all the casting of the net of mayas illusion. Janjalo Jal Rupen Kal Rupen Dhivara. As the spider makes its own web from its own saliva, and binds it together, in the same way, in this illusion, this maya, we say "I", "I". This is my room, this is my son, this is my grandson, this is my wife, this is my father, this is my house, this is my country. This that is "mine"Thakur Ramakrishna has said: "When will I be free? When I ceases to be." This word "I" is the weaving of the net of illusion. This second guru-story I have given to my American disciple, Premananda. Tatpadam Darsitam Yena Tasmai Shri Guruve Namah. What is the word guru? The word guru means he who in the midst of great darkness shows us light; he who removes the darkness; he who lights the lamp of wisdom in us; he who makes us see within ourselves the light of Parabrahma, Paramatma; he is the guru. Today we have spoken of the place of the guru, the meaning of the guru. He who gives the mantra in our ear, and becomes our guru, and takes a fee, and by tradition takes his fee every year, this is not the real thing. The real thing is that "guru" means showing one, making one feel that ineffable truth. He who does that is the real guru. There is a saying, "There are gurus by the thousands, but a real disciple is rare." To Thakur Sri Ramakrishna, when he was calling out to our holy land of India at Dakshineswar, Naren used to come. His original name was "Naren." But how many times Naren would slap Thakur, how much abuse and reproach he used to give. How he would ridicule Thakur. And even so, if Naren would not show up even for a single day, Thakur would fret and worry about him. That Naren, who did so much to proclaim the universal religion in America, his name was Swami Vivekananda. Only one disciple. Thakur made many disciples, but who among them was ripe? Naren. As in our ancient dice game "pasha," if you are "it" (ripe), no one can beat you, so if the disciple is ripe, he has nothing to fear. Today I have given this spiritual instruction to Premananda. It is in Bengali, but he will translate it into English. The guru is indescribable. What will you give the guru? When the student first enters into discipleship, from that moment on the gift to the guru is finished. After that, what is more money, gold, silver? Maya! Then what is the true gift to the guru, do you know? The gift to the guru is this: that truth which the guru has given, to wake up that truth, to exalt it. Repeating the mantra (and in that word mantra is the word "heart" or "mind"), elevating the mind, removing the impurities of the heart, making the heart and mind pure, keeping ones faith in the practice which has been handed down by the guruin all this is the gift the disciple gives. If one attains to that truth, no need for any other thing on this earth will remain. If you see that truth, there is no more desire to see any other thing. If you hear that truth in your ear, then there is no more desire to hear anything else. That is ineffable! 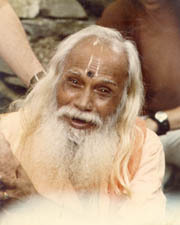 Parabrahma, or Satchidananda, Ananda mayi Purush. Om Shanti, Om Shanti, Om Shanti. We are sitting here at our Ramanathpur Ananda Ashram, near the feet of the Blissful Mother. At this ghat are Premananda, Yogananda, Nityananda, Gyanananda, four boys who have come running from America for the purpose of attaining God. But getting God will not be so easy. Yes, if day by day their eagerness and earnestness grow very great, then of course they will find God, will realize Bhagavan. But here they must have faith. Here I shall tell just one more little story. Once there was a thief, a robber. He used to work always at his banditry. And he would drink wine. And whatever unholy and indecent acts he felt the urge to do, he would do. But one day, taking the mantra from his guru, he asked his guru, "When will I attain to God?" "That day that you take a bath in the Ganges," said his guru, "on that day you will get the vision of God, you will have liberation." The robber would daily go about his stealing. How many unholy murders he would commit, how many robberies! One day he suddenly remembered, "My guru said that if I take a bath in the Ganges, I will gain liberation, I will get the vision of God! This very day I am going for a bath in the Ganges." He called all his relatives and neighbors and the villagers around to watch and he went for a bath in the Ganges. He dived into the water, and coming up he said, "My guru told me that if I bathe in the Ganges I will get the vision of Bhagavan, I will have liberation." But taking his bath in the Ganges, he did not have liberation, he didnt get the vision of God. But this thief, this murderer, did not lose faith in his gurus word. He said, "What my guru said, that is certainly the truth. Therefore this river is not the Ganges! So be it. The Lord and creator of the Ganges is Narayan. So I will go and ask Narayan." All of his friends and family laughed at him and clapped their hands: "How ridiculous!" But the thief said, "No! My guru said it. My gurus word can never be a lie! My guru said that if a take a bath in the Ganges, I will get the vision of God, I will have liberation. So look! This is not the Ganges! The creator of the Ganges is Narayan, so I am going off to ask Narayan!" And off he went, traveling without food, going without sleep. But Narayan could not wait for him. He came on ahead. Standing before that killer, that robber, Narayan inquired, "Baba, where are you going?" "I am going to Vaikunta. I am going to ask Narayan, Is this the Ganges or not? My gurus word cannot possibly be a lie." Then Narayan said, "Baba, you dont have to go to Vaikunta. This is the Ganges!" "Then why am I not liberated?" "Oh thief, you have kept faith in your gurus word! Look! God with conch, wheel, mace and lotus! These four things in four hands. White color, yellow dress, flower garland around the neck! "Narayan thus gave him darshan, and immediately the thief attained liberation. Here I have finished. Om Shanti, Om Shanti, Om Shanti. Today, near the feet of the Blissful Mother, sitting near her feet, I have given this little speech for the American disciples. It was evening time in the small village of Ramanathpur. Baba called the four Americans who had come to see him to come and sit with him at the bathing ghat at the local pond. He told me to bring the little tape recorder which Premamayi had given him. A beautiful Bengali breeze was blowing as he told us these little stories about the meaning of the word "guru." He spoke from beginning to end without pause as he always did when inspired. Truly Baba had never set foot in a school as a pupil and only learned to read Oriya and Bengali late in life, laboriously, from devotees. We did not know much Bengali in those days, and often longed for someone to translate fully what Baba was saying. In fact these words, which seemed to flow as easily as the cooling Indian breeze which was blowing, became the first words of Baba ever translated into English direct from an actual tape. In 1975 a small tape recorder was still a rare and marvelous thing in that remote little village, which did not even have electricity. It was not until over a year later that I would realize, as I was desparately translating it, at last with Pradeep, that he had begun this talk with the words: "Today I shall speak a little bit about the meaning of this word 'Guru' and they will tranlate this into English." Copyright © 1997 The Prahlad Foundation. All rights reserved.